Java is a programming language, application development and deployment environment. The Java programming language is similar to C++ syntax. Java development environment provides tools for Compiling, Interpreting, Packaging the Java code. 2. What are the objectives of Java Technology ? Simple: The language syntax is based on ‘C++’ programming language. Even though the syntax of ‘C++ was adopted, some features which were troublesome were avoided to make the Java programming simple. Object oriented: The object oriented features of Java are similar to C++. One major difference between Java and C++ lies in multiple inheritance. When C++ supports multiple inheritance, Java won't. In OOPs programming paradigm, everything is represented as Class and Objects. Architectural Neutral: The Java compiler generates an intermediate byte code which doesn't depend on the operating system on which it is run. So the Java programs can run on any machine, irrespective of it's OS/Architecture and hence the Java program is Architectural Neutral. Portable type: The size of Data Types is always same irrespective of the system architecture. An int in Java will always be 32 bit unlike in C/C++ where the size may be 16-bit or 32-bit depending on the compiler and machine. Java have libraries that enable to port it's application to any systems like UNIX, Windows & Macintosh systems. Distributed: Java’s networking capabilities are both strong and easy to use. Java applications are capable of accessing objects across the net and local file system. Secure: Since Java is mostly used in a network environment, a lot of emphasis has been placed on security to enable construction of virus & tamper free systems. Smaller code: The Java compiler generates an intermediate byte code to make it architecture neutral. Though Java interpreter is needed to run the byte code, it is one copy per machine and not per program. Multithreaded: Multithreading is the ability for one program to do more than one task at once. Compared to other languages it is easy to implement multithreading in Java. Interpreted: The Java Interpreter can execute Java byte code, directly on any machine to which the interpreter has been ported. Interpreted code is slower than compiled code. High performance: The byte codes can be translated at run time into machine code for the particular CPU on which the application is running which inturn provide high performance. Applet programming: is one of the important features which has attracted the users of the Internet. Applets are Java programs that are typically loaded from the Internet by a browser. 3. What are the Major Features of Java Technology Architecture ? 4. What is Java Virtual Machine (JVM) ? A self-contained operating environment that behaves as if it is a separate computer. For example, Java applets run in a Java virtual machine (VM) that has no access to the host operating system. 5. 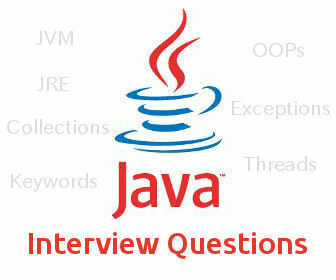 What are the advantages of JVM? System Independence: A Java application will run the same in any Java VM, regardless of the hardware and software underlying the system. Security: Because the JVM has no contact with the operating system, there is little possibility of a Java program damaging other files or applications. 6. What are classpath variables? The classpath is an environment variable that tells the JVM where to look for user-defined classes and packages in Java programs. When a Java program is executed, JVM looks for the required classes needed for the program execution in the filesystem specified in the Classpath. Classes are loaded into the JVM, only when a call is made to use the content of the class object(Lazy Loading). 7. 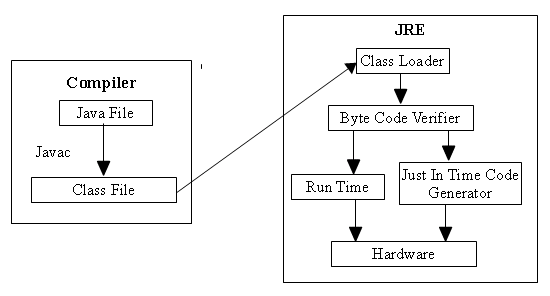 Explain the architecture of code execution process inside JRE ? Java Compilers compile JAVA source code into byte code. Java Virtual Machine(JVM) interpreters Java byte code and send necessary commands to underlying hardware or Just in time compiled to native machine code and execute it directly on the underlying hardware. Most JVM's use Just in time compilation which provides execution speeds near to C/C++ application. Most widely used JVM is Oracle Corporation's HotSpot, which is written in the C++ programming language. 8. What is Java Run Time Environment ? Java Virtual Machine (JVM) along with Java Class Libraries which implement the Java application programming interface (API) form the Java Runtime Environment (JRE). 9. What are the steps involved in Java Application Execution ? 37. What is "this" reference in java? To refer the current object, “this” keyword is used. When we want to pass the instance of the current object to a method in another object, we pass the current instance as shown below. In case, a variable of an object and parameter name of a method in the object are same, we use "this" keyword to avoid ambiguity as shown below. The this() can be called only from a constructor and must be the first statement in the constructor. 38. What are the uses of Java packages? "To organize related set of classes and interfaces, a package is used. It also defines the scope of a class. An application consists of thousands of classes and interfaces, and therefore, it is very important to organize them logically into packages. By definition, package is a grouping of related types providing access protection and name space management." Packages enable you to organize the class files provided by Java. 39. What is the significance of import keyword? To access variables and methods of a class(Car) in another class(Person), we need to include the Class "Car" in Class "Person". This is done using "import" keyword. The import keyword followed by fully qualified class name is to be placed before the application class definition. Above code tell JRE to import all the classes in a package. All the classes in Java.lang package are included implicitly. 40. What is user defined package in java? When you write a Java program, you create many classes. You can organize these classes by creating your own packages. The packages that you create are called user-defined packages. 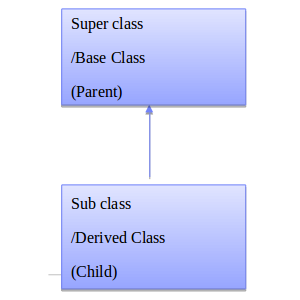 A user-defined package contains one or more classes that can be imported in a Java program. 41. How to compile a Java Source file ? 42. How to compile all the files in a Folder? 43. How to place compiled Java file in a different location ? 44. How to run a compiled Java file ? 45. Why Information hiding is used and how Information hiding is implemented in Java ? 46. What is a Constructor ? The default constructor is called automatically, when an object of that class is created. A constructor has the same name as the that of the class. A constructor always returns objects of the class, hence there is no return type specified in it's definition. A constructor is most often defined with the accessibility modifier “public” so that every program can create an instance but is not mandatory. A constructor is provided to initialize the instance variables in the class when it is called. If no constructor is provided, a default constructor is used to create instances of the class. A default Constructor initializes the instance variables with default values of the data types. If at least one constructor is provided, the default constructor is not provided by the JVM. 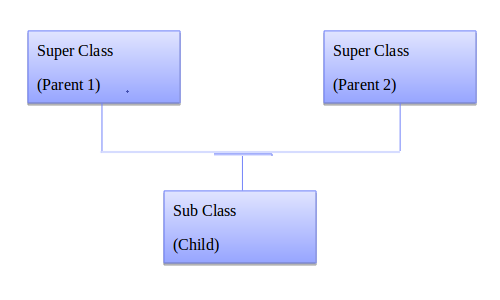 A class can have multiple constructors. 100. What are the uses of exceptions? Easy to pass errors up the stack. Pinpoint errors better in stack trace. As long as you “fail fast” and throw as soon as you find a problem. Wrap useful information on your exception classes and use that information later, while handling the exception. Exceptions don’t always have to be errors, maybe your program can cope with the exception and keep going. 101. What are the types of error? 102. List some exception occurence reason? Running out of memory, Resource allocation errors, Inability to find files, Problem in network connectivity, etc. 103. What are checked exceptions? Checked exceptions are the type exceptions which are checked during compilation. A method which throws a checked exception, should advertise the exception in it's method definition. The method which calls another method that advertises a checked exception can handle it in two ways. One option is to handle the thrown exception in a try and catch block or it should advertise the exception thrown by calling method. 104. What are unchecked exceptions? Exceptions raised implicitly by the system due to illegal code execution are called unchecked exceptions. We don't want to announce the possibility of exception occurrence. When the unchecked exception occurs, and the program is not written to handle it, it would be processed by the default exception handler. 105. How exception handling is implemented using try and catch statement? The try block encloses a piece of code that may create an exception. It also acts as the scope of the associated catch block which handles exceptions. 106. What is throwing an exception? The throw statement causes the termination of the normal flow of control of the Java code and stops the execution of the subsequent statements if an exception is thrown. 107. When should we use throws exceptions? The throws statement is used by a method to specify the types of exceptions the method throws. If a method is capable of raising an exception that it can't handle, the method must specify that the exception has to be handled by the calling method. This is done using the throws statement. 108. How can we create our own exceptions? 109. What are the exception occurrence levels? Arithmetic exceptions; divide by 0, under/overflow. Memory access violations; segment fault, stack over/underflow. Type conversion; illegal values, improper casts. Bounds violations; illegal array indices. 110. What are the categories of exceptions? 111. What is the use of finally clause? The finally block is used to process certain statements, no matter whether an exception is raised or not. Generally, we write resource cleaning operations inside finally block. Like, closing a Java Inputstream. 130. Why should we use object serialization? Object serialization takes an object's state, and converts it to a stream of data. With object serialization, it's very easy to make any object persistent, without writing custom code to save object member variables. 131. How to prevent writing some member data value during object serialization? The transient keyword is used to indicate the JVM that the variables that are marked as transient in an object is not part of the persistent state of the object and it should be excluded while saving the object. 132. What are Reader and Writer classes? Reading and writing character streams are handled by Reader and Writer classes. These classes are abstractions that Java provides for dealing with reading and writing character data. 133. Give few examples of simple Reader and Writer classes? FileReader and FileWriter : Read data from or write data to a file on the native file system. PipedReader and PipedWriter : They are used to channel the output of a program or thread into the input of another program or thread. CharArrayReader and CharArrayWriter : Read data from or write data to a char array in memory. 134. What are FilterReader/FilterWriter, BufferedReader/BufferedWriter and PrintWriter? FilterReader and FilterWriters are subclasses of Reader and Writer, respectively. These classes define the interface for filtered streams which process data as it's being read or written. BufferedReader and BufferedWriter : They buffer data while reading or writing, in order to reduce the number of read/write access on the original data source. 135. What is a File class? It represents a file on the native file system. We can create a File object for each file in the file system, so that we fetch the information about the file from the object. For example, Name, Full pathname etc. 136. What are the functionalaties we get using File class? The File class in the java.io package provides various methods to access the properties of a file or a directory, such as file permissions, date and time of creation, and path of a directory. 137. What are the benefit's of using threads in an application? It minimizes system resource usage. We can access multiple applications simultaneously. Threads simplifies the program structure. We can send & receive data on the network at the same time. We can read & write files to disk simultaneously. 138. What are the differences between process and threads? It is an executable program loaded in the memory. It has its own address space – variables & data structures (in memory). Process communicates via the operating system, files, network. A process may contain multiple threads. It is sequentially executed stream of instructions. It shares an address space with other threads and it has it's own execution context. 139. What are the types of thread? 140. What is single threaded and multi threaded process? Single Threaded Process: A thread is defined as the independent path of execution within a program. A process that is made of one thread is known as single-threaded process. Multi Threaded Process: A process that creates two or more threads is called a multithreaded process.